Using a food processor, chop the tomatoes, onion, and garlic until they’re chopped but not liquid. Put them in a pot along with the chicken broth and carrots, and take it to a boil. Cook for 15 – 20 minutes. In the meantime, heat the oil in a pan and brown the noodles slightly. Add them to the soup and cook them until they’re soft. Check the soup and season with salt and pepper. Add the chicken and serve into bowls, sprinkling some cilantro over them. Serve with lemon wedges so everyone can add lemon as they like. The basic soup doesn’t have carrots or chicken. You can skip them if you want. Add more vegetable if you want a colorful soup. 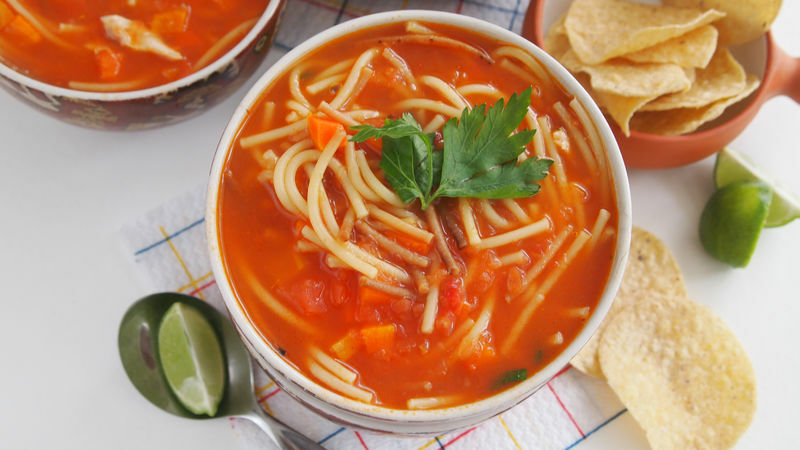 Make it spicier if you want a more flavorful soup.